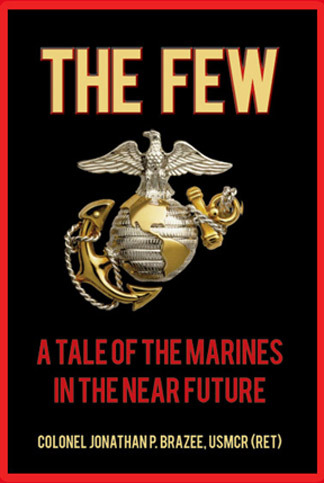 The Few: A Tale of the Marines in the Near Future tells the tale of the Marine Security Guard Detachment at the US Embassy, New Delhi, India during an embassy take-over. The take-over was timed for the visit of the President of the United States, a man, who as a congressman, helped down-size the Corps in a cost-cutting measure. It comes down to Gunnery Sergeant McCardle and his small detachment of Marines to keep the president alive until help can arrive. But with an ambitious vice-president stalling that rescue, can the detachment succeed in this task? The Marines have a history of defeating long odds, but this situation will put that history to test. Taking place in Quantico and Washington, in Thailand, aboard the USS Reagan, and, of course, in New Delhi, this novel brings together the many stories of the people involved. For an excerpt of The Few, click here. The Few is available in both regular print and as an e-book at some bookstores and with online retailers such as Amazon.com. The Proud is the second volume of The Return of the Marines trilogy. It follows some of the original characters of The Few as they combat piracy off the coast of Somalia. Click here for reviews of The Proud. The Marines finishes off the trilogy with a conflict with China over the Spratley Islands. Colonel Jonathan P. Brazee, USMCR (Ret) served 34 years in the US armed forces. Graduating from the US Naval Academy in 1979, he served on active duty as infantry, air delivery, and reconnaissance platoon and company commanders, as the Commanding Officer of MSSG 31, and in staff and recruit depot billets. As a reservist, Col. Brazee served in various staff billets and with the 3d Civil Affairs Group as the military liaison to the US Agency for International Development in Baghdad, Iraq, in 2006. He retired from the Corps in 2009. With a doctorate from US International University in San Diego, Col. Brazee has published regularly in the business, political science, and military fields. The Few is his first novel. He can be reached at corter79 at hotmail dot com. Also by the author is Wererat, an odd take on lycanthropy and shapeshifters.